/Frequently Asked Questions /What is Chamasoft? Chamasoft is a web and mobile platform which automates operations within investment groups. It focuses on promoting accountability, transparency and efficiency. Below is an image of an investment group using Chamasoft to manage their group finances. It gives a detailed summary of the group’s total cash available (in the bank and at hand), total contributions, total fines and total expenses and each members total contributions vs arrears. Chamasoft achieves this by providing a feature rich platform that caters for the needs of a thriving investment group. This module on Chamasoft handles all the group member accounts (all members registered on Chamasoft have an account created for them, which they can use to login to the group). If a member defaults in paying for their contribution, Chamasoft automatically calculates the members’ penalty and updates his/her statement. Chamasoft allows one to record withdrawals, transfers and deposits that are performed on the Sacco bank accounts so as to be able to track what is happening in the bank accounts. 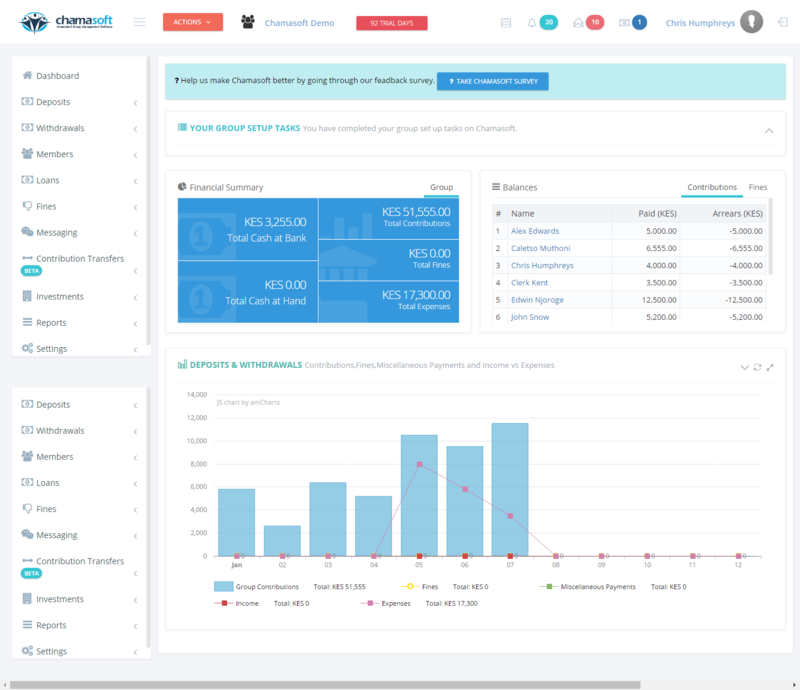 Chamasoft allows users to track expenses as they occur, be it for land purchases or payments for services. This expenses are recorded in the withdrawals module of Chamasoft. Through our loans panel, Chamasoft provides a platform where Sacco’s and investment groups can record and keep track of their internal lending. This module on Chamasoft enables the group members to keep track of projects e.g. Expenses regarding purchase of property, stock and money market investments. This module on Chamasoft enables the user to view all the group transactions summary.